The Martin Yale 1217A Medium-Duty AutoFolder creates a variety of different folds: letter, half, z-fold, double parallel, right-angle, and baronial, with speeds of up to 10,300 sheets per hour. This machine provides a conveyor delivery system and preventive jam features, like removable tables and reversing switch which makes this one of the most versatile machines on the market today. The reinforced drive system provides accurate folds every time, with a maximum paper size of 11 3/4″ x 18″, this machine is sure to be a benefit to any environment. This machine features a large fully adjustable paper guide for ease-of-use and accuracy, large rubber rollers for consistent paper feeding and professional folds. The folded materials emerge on a durable conveyor belt which creates easy-to handle, fanned stacks ready for distribution. 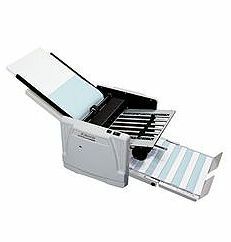 The 1217A AutoFolder is ideal for use in churches, schools, business offices and medium to large mailrooms. If you have any questions or are interested in purchasing the Martin Yale 1217A AutoFolder, visit us at SpiralBinding.com. We have great pricing on a full line of Friction Feed Paper Folders. Call us at 1-800-631-3572 for more information!